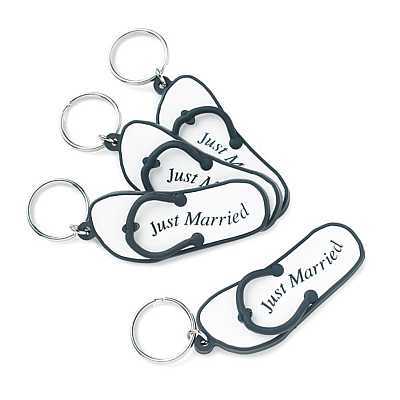 Beach keychain favors are really unique and practical beach wedding favors. 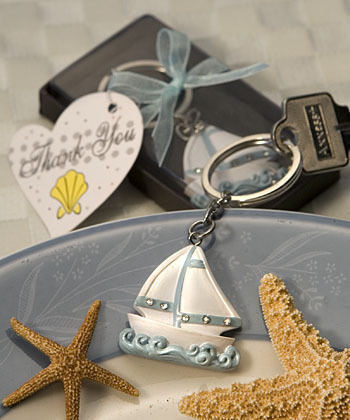 Beach keychain favors are perfect for use after the wedding. The beach key chains are also great for beach themed parties and pool parties. Flip Flop Keychains These cute flip flop keychains are a great addition to your beach themed event. Great idea to add to a hotel gift package for your out of town guests. 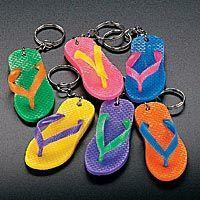 2.5" plastic flip flop keychains Price is for the set of 6 assorted flip flop keychains. Some will be plain and some have a flower print same as the flip flop magnets. Great inexpensive beach wedding favors. There is no left and right sandal. Rhinestone sailboat keychains are the perfect beach wedding favors to get your guests sailing! Each resin sailboat keychain is decorated with rhinestones and packaged in a clear favor box, tied with organza ribbon. Each sailboat key chain measure 1/4"x 3" x 1". Minimum order is 30 sailboat keychains. Price is per sailboat keychain.